Why Does Your Tile and Grout Floor Become so Easily Stained? If you have tile in your home, you may wonder why the grout gets so dirty and is so difficult to clean. Grout can be beautiful even though it is necessary to fill in the spaces and hold tile pieces together. But grout is porous and will absorb bacteria of many kinds making it easily and quickly unattractive. To make matters worse, some liquid substances can penetrate deep within the grout causing it to look discolored. Amazingly, one of the most common causes of discolored grout is dirty mop water. When your cleaning water becomes dirty, the dirt from the tile will just spread and “seep” into your grout. Since the grout is the lowest part of the floor, the dirt and grime from your dirty mop water can settle into the grout. This can be frustrating that right after you clean your tile and grout floor, it will look dirty and will be a source of bacteria, mold, allergens, and mildew. Once grout is stained, it can be hard to remove the stains. It is important to ask your tile manufacture the proper way to keep your tile and grout clean between professional cleanings. And it may be time to have a professional tile and grout cleaning to effectively extract the dirt and grime from your tile floors. Once professionally cleaned, we can apply a color seal to your grout to help reduce the amount of dirt that penetrates into the grout. The sealer will help you retain the original look and color of your grout between professional cleanings. Your tile floors are a beautiful investment in your home and they receive a lot of foot traffic. Every time someone walks over your tile floor, they are transferring dirt and germs onto your floor. No matter how often you clean, it can be a difficult task to keep your tile floors always clean and healthy. With the help of Chem-Dry professionals, you can have sparkling clean floors that are healthy for the whole family. Chem-Dry uses specialized cleaning solutions and powerful suction equipment to blast the dirt and grime from your tile and grout that has been building up for years. After we get your floor clean, we will apply a sealant that will create a barrier. This will minimize the amount of dirt that is able to seep into the grout pores. This will help keep your grout cleaner, longer, and maintenance will be simpler because dirt doesn’t penetrate as easily into the cracks. Stop spending hours on your knees for a surface clean. Call Chem-Dry of Michiana for a free estimate on our deep cleaning of tile and grout. Our cleaning system will leave your home Cleaner. Drier. And Healthier. Is it Important to Clean Your Tile, Grout & Stone Floors? Just like with your carpet or upholstery, the tile and stone in your home can also accumulate dirt over time. This can not only give the floor an appearance of being “dull”, but it can also discolor the grout. And over time, as the dirt builds up in your tile and stone surfaces, it can easily become a breeding ground for bacteria to settle into your floors. Eventually you will need specialized cleaning solutions and powerful suction equipment to get your floors free of the dirt and bacteria. To actually spend hours on your hands and knees is back breaking work and many times the dirt just doesn’t want to release unless you have certain solutions and powerful suction. 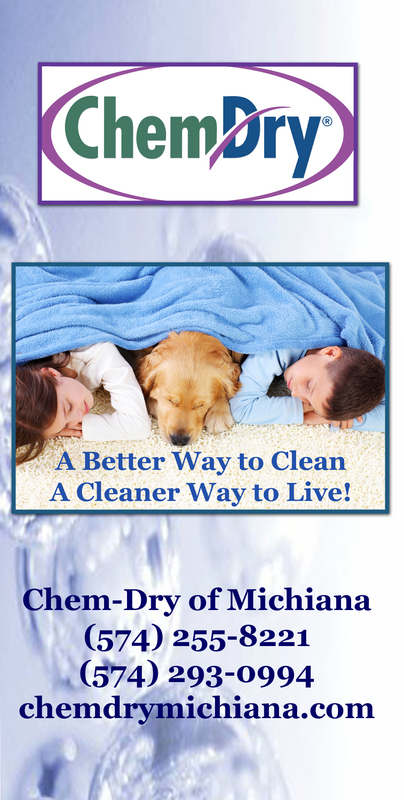 Chem-Dry of Michiana has the specialized cleaning solutions and the powerful equipment to get your tile and stone clean and healthy. We can gently “blast” the dirt and grime from your tile and stone floors. This will leave your floors clean, healthy and extend the life of your floor surfaces. If you think your tile or stone might be ready for a professional cleaning, call us to schedule a free demonstration and free estimate. This will determine whether it’s time to hire a professioal for the tile and stone in your home!